This delicious arrangement of Cookie Blooms is a gift that is always in good taste and is sure to delight cookie lovers of all ages! Our Cookies are hand made Vanilla Sugar Cookies, freshly baked and iced within hours of being out of the oven. 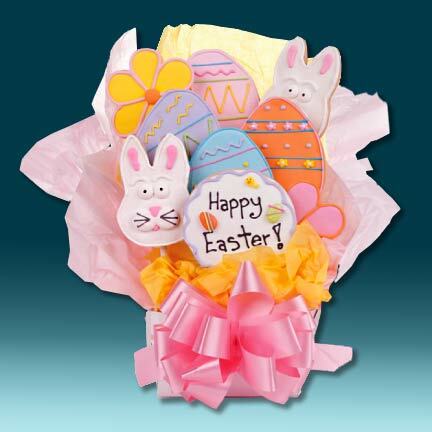 This popular assortment is a great gift for a Hoppy Easter and features brilliantly hand decorated Eggs, Bunnies, Flowers and a Cookie Plaque that conveys your message!